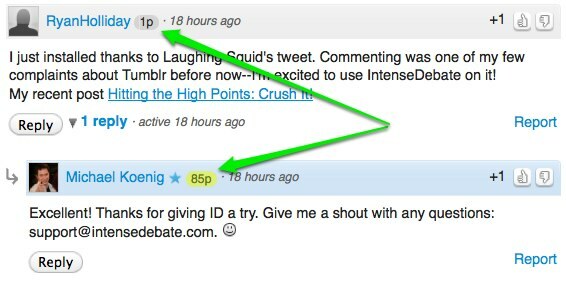 Each IntenseDebate and WordPress.com user has a reputation score that accompanies their profile. This is the number next to your profile picture in the comment displayed when you post a comment. Reputation scores are determined by an algorithm that takes into account the number of posts you make, the number of up votes or down votes, and also factors in a time variable. Negative votes will impact your reputation score more heavily. Please note that this means that you will not receive an increase in your score every time you post a comment or receive an up vote. Keep posting and you’ll get there! Tags: Profiles, reputation score, voting — Can't find your answer here? Let us know.